Above, an oscilloscope is connected to the receiver output and the volume control is adjusted until the peak voltage is 2.4 divisions, corresponding to peak deviation of 2.4kHz. The instrument does not need to re a real scope, it could be a soundcard scope like Soundcard Oscilloscope, or sound recording software like Audacity. Having calibrated the receiver and display, we can go on to measure the unknown transmitter(s). 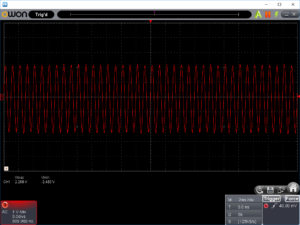 Above is a capture of speed input to the transmitter under test. 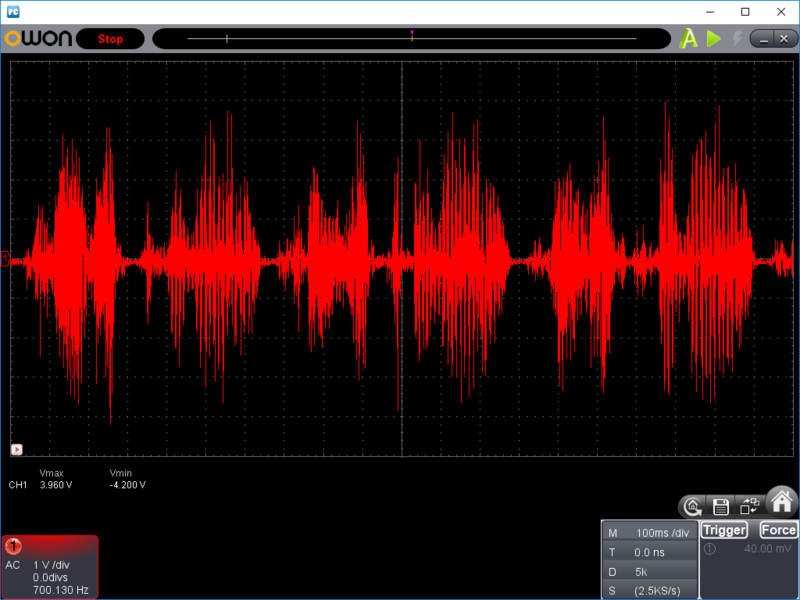 It can be see that most of the time, peaks are reading the equivalent of 3kHz, very occasionally reaching 4kHz. But isn’t it actually PM… or what about pre-empahsis and de-emphasis? Well, although everyone refers to it as FM, it is FM with 6dB/octave pre-mphasis over the entire speed spectrum which gives the characteristic as PM. The demodulation process approximately equalises the pre-emphasis so the audio channel is nearly flat from end to end. To a certain extent then, it is a nonsense to talk of peak deviation of frequency in kHz when in fact it is PM and the peak deviation is phase in radians. Nevertheless, that is the convention. The process above adjusts the transmitter for speech drive equivalent to 3kHz peak deviation at 1kHz. Many test sets used in the Land Mobile Radio field measure deviation in a non de-emphasised demodulator, some offer a choice of with or without de-emphasis. In practice, it makes little difference on voice tests of male speakers. The procedure above was compared with that obtained using a Motorola R2009D Communications Monitor, and the results are consistent. It is important to understand that FM Land Mobile Radios often (usually) include a peak limiter in the tx audio path, and there is likely to be two adjustments, one prior to the limiter often labelled “mic gain” and another between limiter and modulator often labelled “deviation”. The deviation control is usually adjusted so the peak deviation does not exceed 3-4kHz under the loudest speech peaks, and the mic gain is adjusted so that normal speaking levels cause 3kHz peak deviation (equivalent). If stations report your deviation is high or low, firstly make sure you address the microphone properly and speak with a consistent and strong voice. If it turns out your voice is unusually soft or load, it is probably the mic gain control that requires adjustment rather than the deviation control, yet people tend to thing “low deviation – wind the deviation control up”. This is not the only way to achieve the outcome, but an example to show that practical tests of good quality can be designed to exploit available equipment. This is after all, the role of the measurement technician.